Paper Dress Xmas Bash, Presented By SOTSA! 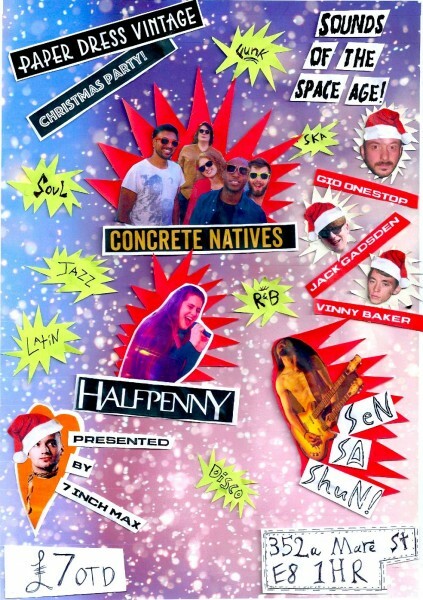 Paper Dress Vintage and Sounds of The Space Age are teaming up to bring you the most soulful Xmas party this year! (probably). Guest DJs Gio Onestop, Vinny Baker and Jack Gadsden are guaranteed to make you party so hard, you won’t be arable to think straight for rest of the month! Concrete Natives, incorporating a blend of soul, rock’n’roll and the blues with contemporary influences coupled with an electric live performance, they deliver a fresh take on the classic New York funk sound. Sen Sa Shun, Japanese-Brazilian Funky Psychedelic Rock’n’roll Punk band formed by three musicians from around the globe! hosted by 7 Inch Max!